Communication senior Sean Earley, a member of the A-status finances committee, speaks to Senate at its meeting Wednesday. He said the committee spent more than 80 hours drafting the proposal for the roughly $1.1 million A-status funding plan, which Senate approved. ASG’s president and executive vice president launched a campaign at Wednesday’s Senate meeting to pressure Provost Daniel Linzer to include more students in a faculty task force examining the undergraduate academic experience. The three-hour meeting began with Associated Student Government President Noah Star and Executive Vice President Christina Kim asking senators to email Linzer and publicize a petition calling on the provost to increase the number of undergraduate students on the task force from one to five. As of Wednesday night, about 500 people have signed the petition. The last time a similar task force convened was in 1988, Star said, and five students sat on the committee. Star, a Weinberg junior, said the task force could push for reforms student government has advocated for, such as credit requirement reform and a Social Inequalities and Diversities requirement. Kim said a task force like this doesn’t come around often, so it should include student voices. Weinberg junior Riko Ohashi, ASG vice president for academics, is currently the only undergraduate student on the task force. The task force launched in March and is tasked with spending this quarter and Fall Quarter collecting data and drafting recommendations before presenting to Linzer in Winter Quarter 2016, neurobiology Prof. Indira Raman, the task force’s chair, told The Daily earlier this month. Later in the meeting, Senate approved nearly $1.1 million in A-status funding for the 2015-2016 school year after allocating almost $6,000 in amendment pool funding. Senators spent more than two and a half hours debating how to spend the $58,925 amendment pool, the supplemental funding Senate can allocate at its discretion. Members of the A-status finances committee spoke against every motion to dip into the amendment pool and give a group extra funding. 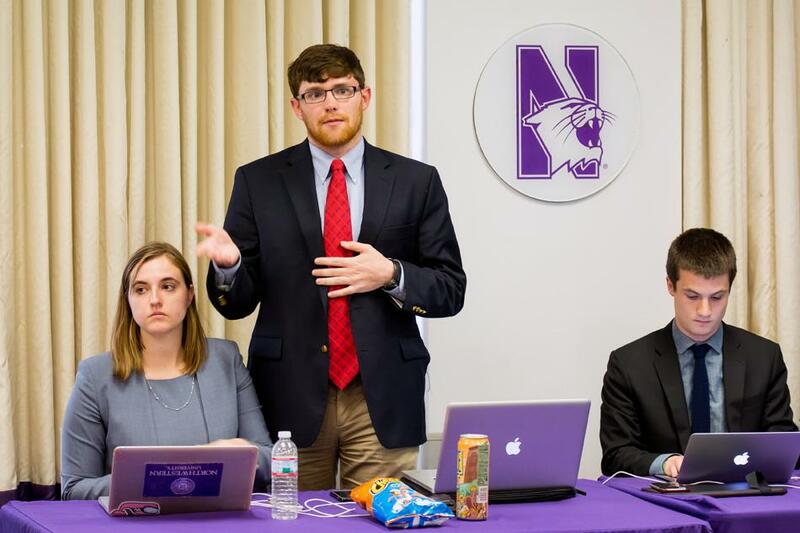 Communication senior Sean Earley, a member of the committee, told senators the committee spends more than 80 hours deliberating and forming a funding proposal. Throughout the session, the committee stressed that senators should be frugal with allocating the amendment pool. McCormick junior Magan Omar, a committee member, said senators should consider the consequences of any allocation decision. “Every dollar that comes out of the amendment pool is a dollar that other groups won’t be able to use for supplemental funding,” he said. After rejecting a proposal to give For Members Only nearly $3,000 for its spring concert, Senate approved $1,969 for the event. It also approved Dance Marathon’s request for $1,200 to fund porta-potties for the Winter Quarter event. Weinberg junior Kevin Harris, DM’s executive co-chair, said the funding will allow the group to increase the number of porta-potties from two to six. A-status funding comes from a fee students pay every quarter, which will be $58 per student per quarter next year. And, keeping with tradition, Senate gave Northwestern Community Development Corps $1,750 to buy candy for Project Pumpkin. The event, held the Thursday before Halloween, brings more than 1,000 children from Evanston and Chicago to Norris University Center to give them “a safe place to trick-or-treat,” said Weinberg senior Taylor Billings, outgoing NCDC co-chair. Earley responded with a facetious presentation that likened candy, a slang term for cocaine, to the drug, feigning opposition to the request. Star said the exchange is a quirky Senate tradition born out of A-status finance committee rules that prohibit it from giving groups funding for food.